Join the CHHC and Lisa Mangiafico, author of Cherry Hill: A Brief History, for a look at Cherry Hill’s noteworthy entertainment era. From the GSP to the Latin Casino, Hawaiian Cottage, Cherry Hill Mall, and more, Cherry Hill enjoyed years of top-rate dining and entertainment venues. The May 7th program will encourage audience “show & tell”; share your stories and memorabilia from this fantastic period. Who did you see perform at the Latin Casino? Did you dance with Moana at the Hawaiian Cottage? Perhaps you still have a winning ticket from the Garden State Park? Join us for a fun evening of history and stories. Copies of the CHHC’s book, Cherry Hill: A Brief History, will also be available that evening at a special rate of $15. stories. 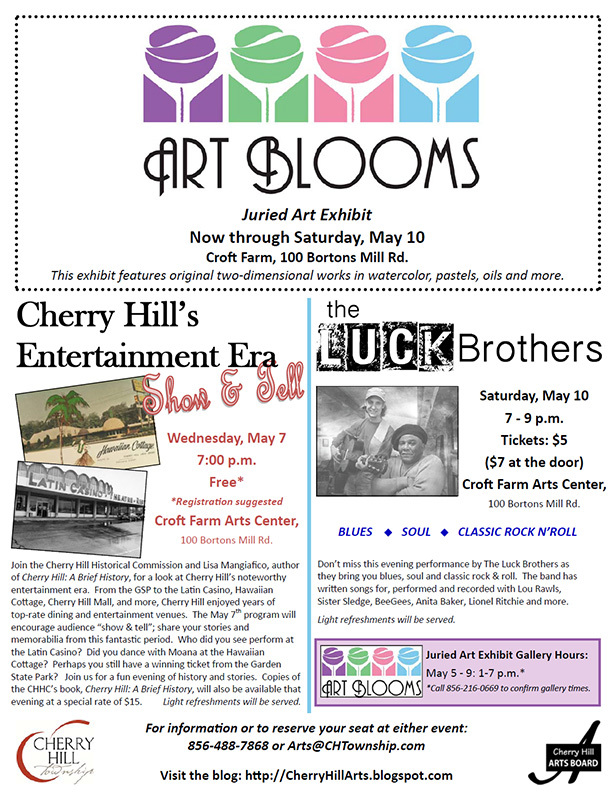 Copies of the CHHC’s book, Cherry Hill: A Brief History, will also be available that evening at a special rate of $15.